Our quality policy is simple and direct. Fully understand our customers’ needs and expectations. Meet our customers’ expectations on time and in full. Comply with our own quality management system requirements. Our employee turnover is almost nonexistent at Advanced Coating. The result is a workforce with an average time in service of 8 years for the production staff and 12 years of management and support. The bottom line is that our folks have a lot of experience honing their craft and are fully competent to deliver both the tactical and the strategic elements of your project. 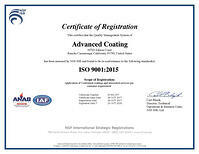 Advanced Coating is registered to ISO9001:2015. Select to download a copy of the certificate. Advanced Coating is also ITAR registered. Our UR (urethane), AR (acrylic) and SR (silicone) coatings are IPC-CC-830B qualified. Our XY (parylene) coating meets the requirements of both IPC-CC-830B and MIL-I-46058C. As you expect, supporting documentation is available. Our stable of 12 coating machines, 2 automatic aqueous washing machines, 2 plasma machines, multiple ultrasounds, multiple convection, and vacuum ovens and a vapor degreaser provide a lot of throughputs, a lot of options and a lot of redundancy. HEPA filtration protects the building in general, and a clean room is available as required. Typically the sampling plan is 100%; every piece gets inspected at each processing point. In the event 100% is impractical, and in the larger quantities of non-PWB items that may be the case, C=0 sampling plan with an AQL of .65 is the default. Dimensions are controlled with the Filmetrics F20 Thin Film Analyzer, calipers or micrometers as is suitable to the task. Quantifiable cleanliness testing is provided using Aqueous Technologies Zero-Ion G3 organic contamination tester. Visual inspection is bolstered with dozens of magnifiers, at least a half dozen microscopes, various specialized lighting devices and, arguably, the most experienced and capable inspection staff in the industry. Calibration of all items of measuring inspection and test equipment is traceable to a NIST standard. Calibration system meets the requirements of MIL-STD-45662. Our ESD control meets the requirements of MIL-STD-1886. Features include ESD safe totes, racks, carts, floors, mats, smocks, workstations with continuous monitoring, ionizers, wrist straps, heel straps and, finally, monitoring and management of %RH.